Though the OED has been around since the nineteenth century, the three-volume Compact Edition, per New York Times “On Language” columnist Ben Zimmer, was first published in 1987. Poor Lane. Even his bookshelf was living a lie. Message boards on the Trains magazine forum lit up when Don mentioned taking the Broadway Limited from Ossining to Grand Central. In 1963, the Broadway Limited was operated by the Pennsylvania Railroad and therefore went to Penn Station. (PRR didn’t merge with the New York Central Railroad until 1968.) “The character Don Draper would not make that mistake. I’m a fan of the show and am very disappointed with the writers,” wrote one displeased commentator. Ad agency CEO Adam Hanft at the idea that Don Draper would have carte blanche to pitch his ideas without running them by Bert and Roger: “There’s no way that management would ever walk into a big client meeting—in this case, for Lucky Strike cigarettes—without seeing the creative work in advance,” he wrote in Slate. The celebrity face of Mad Men anachronism-hunting is news anchor Brian Williams, who used his NBC blog to question whether Don could have been watching a nighttime NFL game on TV in 1964. Sure enough, prime-time football didn’t start until 1970. And the game’s slow-motion replay? First tested on an NFL game by CBS in 1965. While the rest of us were gawking at Roger’s blackface performance of “My Old Kentucky Home,” one Vulture reader noticed that his garden-party drummer was using a crash cymbal from the future. A conversation with a Zildjian rep confirmed that the shiny finish on the instrument wasn’t available until the seventies, while its “K” logo brought the timetable up to the eighties. While on the psychiatrist’s couch, Betty mentioned that her neighbor’s “jealous” attitude brought her back to her sorority days. However, the character attended Bryn Mawr, which has no sororities. It’s one of “two big blunders” that showrunner Matt Weiner admitted himself. Weiner has also copped to the fact that Joan wouldn’t have been quoting media theorist Marshall McLuhan in 1960. (The phrase was popularized in his 1964 treatise Understanding Media: The Extensions of Man.) “Unless she was in his class in Canada, she wouldn’t have known,” he said. Of course, now we’re envisioning McLuhan busting into the scene, Annie Hall–style, to clear that up. During this revelatory episode, a three-volume collection of Griffin’s “The Corps” series (written in 1986, 1987, and 1990, respectively) can be glimpsed over Betty’s shoulder. The military novelist’s official website now boasts of the error, which was discovered, oddly enough, by George W. Bush speechwriter and RedState.com founder Joshua S. Trevino. Font designer Mark Simonson is a big Mad Men fan, and apparently pays more attention to typeface than the props department does. In an astonishingly eagle-eyed 2008 takedown on his blog, Simonson pointed out that the sign on the Sterling Cooper building is Gil Sans, which was not in popular use in the U.S. until the seventies. Other future fonts he spotted on the show, mainly in shots of print ads: Fenice (1980), Balmoral (1978), Amazone (1958), ITC Kabel (1975), Bookman Old Style (1989), Zapfino (1998), and Gotham (2002). EW commenter Michael Grinspan observed that the windows of Sterling Cooper Draper Pryce look out onto the Swiss Bank Tower. That building is indeed adjacent to the Time Life Building. But it didn’t exist until 1990. If Peggy had been talking about the Sterling Cooper office, this line would fit right into 1963. But she said it after smoking marijuana and was clearly talking about a state of mind. “Its modern usage is metaphorical, having to do with spirit and development,” wrote New Republic linguist John McWhorter, who says he first heard the phrase used by a New Age acolyte in 1994. Historian Benjamin Schmidt decided to analyze Mad Men’s dialogue with the Google Books Ngram viewer and concluded that the most glaring error was the frequency of the phrase “I need.” “To say ‘I need to’ so much is a surprisingly modern practice: books, television shows, and movies from the 1960s use it at least ten times less often, and many never use it all,” he wrote in The Atlantic. The less urgent “ought to” would be the more accurate term. Of course, Don isn’t the kind of guy who feels he ought to do anything. He is, however, a man of many, many needs. The moderator of the Cold War–themed Facebook page All Things Atomic captured an image of a fallout shelter sign in the hospital where Roger is treated for his season-one twin-induced heart attack. That sign appeared a year too early; the first ones were posted in 1961. Peggy’s comment that she’d heard Bob Dylan on the radio inspired a fascinating, if somewhat inconclusive, discussion on the fan site Basket of Kisses. The episode is set in fall 1962, before Dylan produced any singles, and shortly after the release of his none-too-successful debut album. However, since Dylan was a well-established Greenwich Village folkie, it’s possible that forward-thinking Manhattan disc jockeys would have given him airplay. Here’s one that actually happened with Matt Weiner’s blessing. The typewriters in the 1960 Sterling Cooper office were a year ahead of their time; the Selectric model was introduced in 1961. On the season-one DVD commentary, Weiner explained that the 1960 typewriters were difficult to obtain, hard to repair, and would have required a doozy of a sound-editing job to re-create the manual carriage returns. So he fudged it. 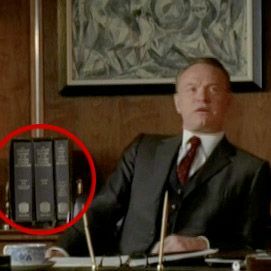 According to ShareTV’s Mad Men trivia board, selected telephones on the show “are shown with RJ-type modular connectors, which were not introduced until the mid-1970s.” Seriously? If that’s the best nitpickers can do, then congratulations, Mad Men props department: You win.